A report card assessment is used throughout the year. Four quarters of teacher delivered differentiated instruction with quarterly benchmark assessments are implemented. Mid-term and quarterly student and parent conferences are held every quarter. 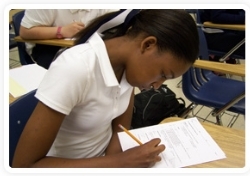 Student assessments are ongoing daily to monitor students progress to meet and exceed the academic content standards. Our Math program teaches sorting, money relationships, ordinal numbers, telling time, and problem-solving techniques, which gets students ready for our Annual School Math-a-thon. Our Science and Math approach is very hands on and introduces the Scientific Theory approach in collaboration with our Annual Science Fair.